While Adele may be busy Chasing Pavements, I’m busy chasing deadlines. Not much “free” time on my docket today but I wanted to leave you with a few thoughts. Actually one thought. Be nice. 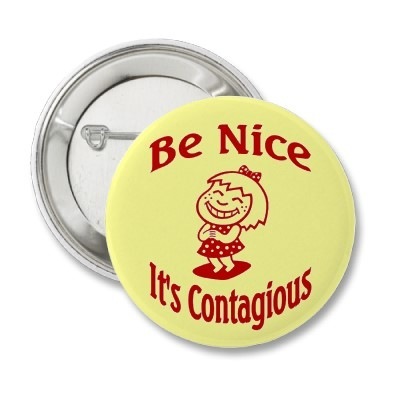 Be nice to others. Smile. Encourage others. Go the extra mile to just be a good person. Keep the meanness in check. Its impossible to know what is going on in the life the the stranger you have never met. That person who cuts you off my be racing home to their sick child. The person who is grumpy and nasty may be over worked by a crazy boss who never says thank you. The angry man may be miserable inside and projecting onto the rest of the world. The spazzed out women may be trying to figure out how to feed her kids tonight. Know that sometimes your kind word (or two) maybe be the only kindness they will receive today. Or this week. Or this month. Be nice to others. It’s worth it. 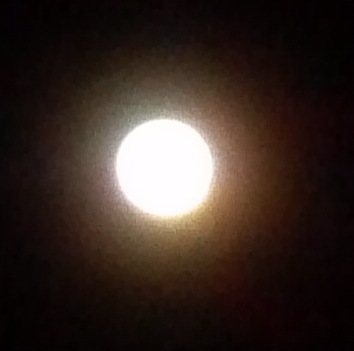 By the Light of the Moon…. 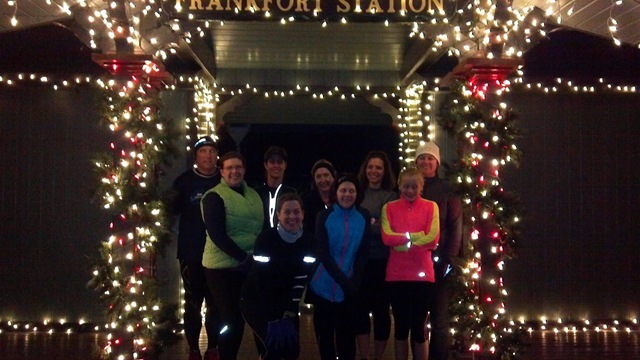 It’s no secret the Wednesday nights are my favorite because I get to run with the F’N Running Club. 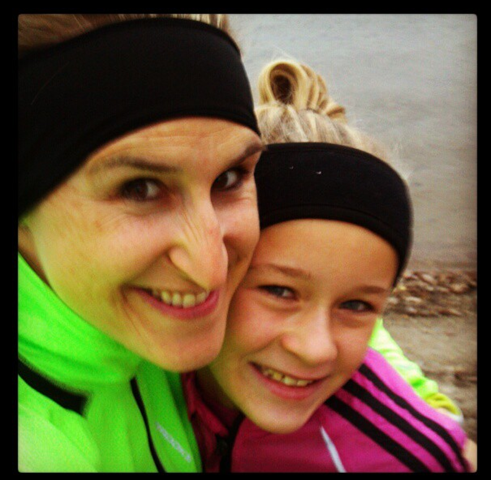 It is frequently the only club run I can work into the family schedule so I look forward to it each and every week. 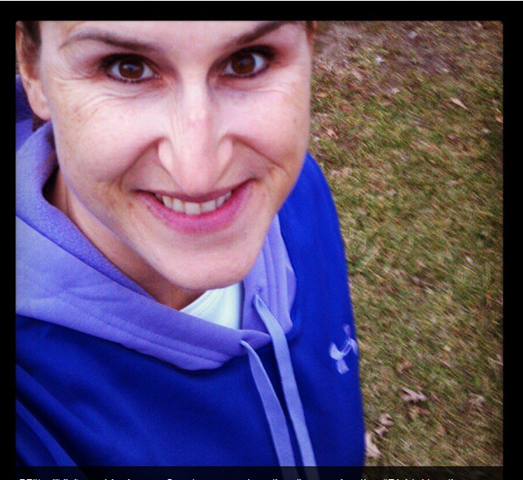 It’s also no secret that I LOVE to run outdoors regardless of the weather. What could make a WED night outdoor run even better? Christmas Lights & a Full Moon! My favorite WED night, photo spot is back in operation! The Frankfort Station pavilion beside the Grainery. Christmas Lights are up, check! Runners are in place (above) with a smile, check! Left Back: Ken, Dawn, April, Lynn, Susan & Nicki. Left Front: Diane, Betsy & Aby. 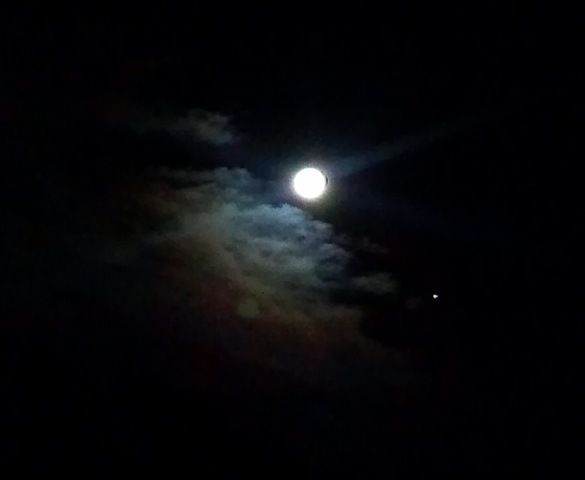 Plus the temps were mild and the Full Moon was breathtaking even though my photog skills leave a bit to be desired! 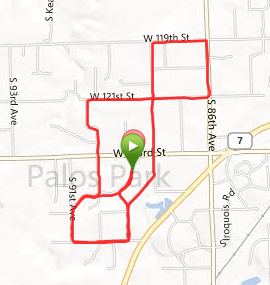 I was so enthralled by the full moon that I went back out this morning to get a short run in before work. No KnuckleLights needed this morning. The moon lit the way perfectly. A few twinkling stars added to the fun and it was a great start to my morning. What makes a great run, just a bit more “perfect” for you? Okay, let’s do this! The response has been great on the Divide Hoody review! Everyone is loving the Under Armour Hoodies! We are giving away 1 purple Divide Hoody to a lucky winner! To be eligible to win, you need to comment below and tell me which UA hoody you would most like to try. The link to all the ladies hoodies can be found HERE. Mens hoodies HERE. Bonus point #1: Like the UA Facebook page HERE so that you will be up to speed on their newest specials! Leave a separate comment below telling me that you “liked” them on Facebook and leave me your FB name so that I can verify if you happen win via that avenue. Bonus point #2: Follow me on Instagram cuz what fun is it when I only have 2 friendly followers? Not fun. The new TooTallFritz Instagram link is HERE. Please leave a separate comment below stating that you are my new Instagram BFF! That gives you 3 possible ways to win. Separate comments for each entry, please. 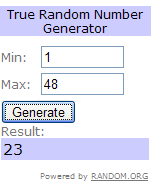 I will select a winner via a random number generator on Monday, December 3rd at 9am. Good luck!! There is a bit of hoody mania going on over at Under Armour! 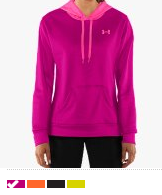 They have hoodies in every color imaginable and recently had them on sale for 25% off! We took your favorite performance hoody, added a little subtle color blocking, and lightened it up for the perfect amount of protection. Not too heavy but not paper thin either. And if you need to up the warmth factor, the slick exterior makes laying super easy—no struggling or stuffing necessary. And, of course, the soft, brushed underside circulates your body heat for lasting warmth even on its own. I managed to score one of these babies in purple and tried it out yesterday on my 6 mile run at Yankee Woods. Although I see people wearing hoodies all the time, they are not a normal “go to” cold weather item for me. I prefer a more fitted layering system and in the past that was not the hoody design. However, over the last several years, Under Armour has developed a line of hoodies for women that are both technical and fitted. The hoody no longer represents a sloppy, ill-fitting “sweatshirt” but is now considered a fitted piece of technical clothing! 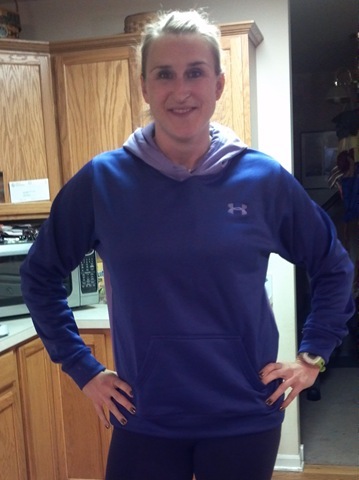 I quickly found my favorite aspect of running in a hoody …… the amazing pocket! 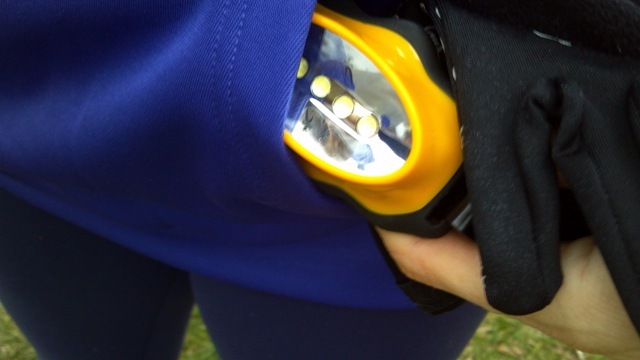 I was able to fit both knuckle lights and my gloves in that amazing pocket! I feel like hoody wearers have conspired to keep this valuable bit of info from me! Is this a secret amongst the hoody wearing community? The best part is that I could have fit much, much more into that pocket had I wanted/needed to do it. For a mom who travels with everything, including the kitchen sink and pepper spray, this was a major score in my opinion! The hoodie kept me super warm and I was actually sweating within the first few miles of the run. Plus all the stuff in my pocket didn’t bounce or drive me crazy. Win, Win!!! I did get this hoodie in a size large, which is bigger than I need, but on the same hand it doesn’t look bad. Since I don’t own any other hoodies, I just went with the size I would normally wear in most fitness clothing. 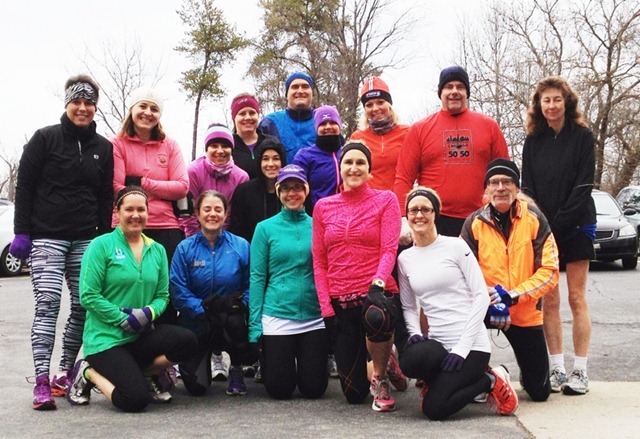 As I look back at the order of my beloved UA Base 3.0 1/4 zip (in black on the left and in blue with Joe & Julie on a wintery run on the right), I see that I’m a medium in UA. Oppps! Use the size chart so you don’t make the same mistake. I like my winter layers to be tight against my core so that heat doesn’t escape. I didn’t have an issue with air getting in or my heat escaping the Divide Hoody but would probably size down for my next one for a more snug fit. I love the pink and the yellow; I can’t decide, look at these amazing colors! As we close out Thanksgiving for 2012, I look back at what the year has brought us. It hasn’t been easy and I’ve wanted to jump off the roof to avoid the noise of screaming/fighting children multiple times but it always seems a little better in hindsight and I am always thankful. I’m thankful for the health of our “little” ones. I’m thankful hubby and I both have jobs. I’m thankful hubby and I haven’t killed each other because of those little screaming/fighting angels in stressed out states of mind. I’m thankful the holidays are upon us so that we can CELEBRATE the close of 2012 glory of the season. 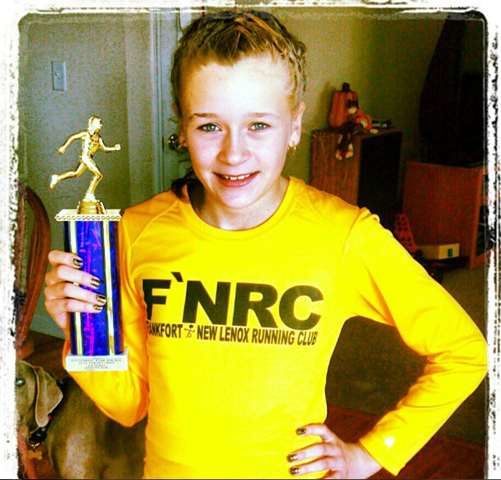 For me, the best part of 2012 has been watching Aby come into her own as a runner. Watching her on the Cross Country course, really running, in a strong way I had never seen before this year. 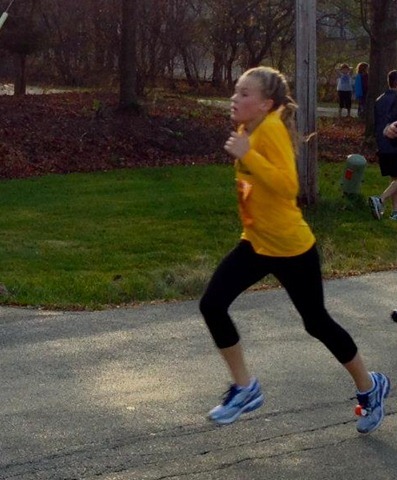 Watching her at races, as I trailed behind her knowing that forevermore, she will be the fastest runner in the house. Running side by side with her on the trail and in weekend runs when she opted to stay with me rather than running ahead. Taking her to races that she has never been able to run before because I now know that she can hold her own and is mature enough to handle real races and tough terrain. Watching her collect some serious hardware along the way. It really has been an amazing year! The Thanksgiving Holiday brings most of us a 4 day weekend and plenty of time to reflect on the things for which we are thankful. It is by far my favorite weekend of the year and the only one where I can expect 4 days off work in a row. The only one we automatically know on which day of the week the holiday will fall. Definitely the easiest one to plan and the easiest to set up annual traditions. I’ve been trying to become more traditional over the last few years, trying to keep at least a few things the same from year to year in both family and life so that on occasion we can step away from the chaos for just a minute and KNOW what to expect. During a time where we are taught to expect the unexpected, it’s comforting to make, and then hang onto, a few traditions. Which holiday is easiest for you? Which holds the most “traditions” for you and your family? More up on our Thanksgiving traditions tomorrow! Since I plan to be MIA for the rest of the week, I thought I would do a roundup today of all the cool discounts that I know of at this time. I know more are out there that I have yet to come across so please feel free to comment below to share the discount love! Whooha Gear – Inspirational Athletic Wear – 10% off with Discount Code: TTFWHOOHA (good thru Jan 1) & additional Black Friday specials to be announced via their Facebook page on Friday. Tough Chik is starting Tough Chik Tuesday. This will begin next Tuesday (11/27/12) and they will announce a “killer deal” that will be available for a short 48 hour period. You can capitalize on Tough Chik Tuesday EVERY week until Christmas. 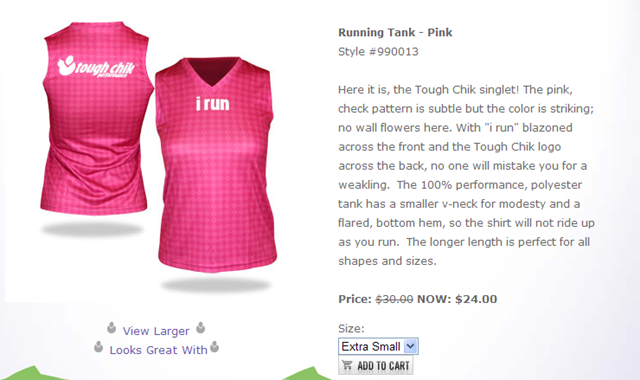 Watch the Tough Chik website and Facebook page for specials on their already amazingly low priced items. I see one of my favorite i run tanks is already on sale for $24! Pro Compression – Compression socks & sleeves, definitely one of the best compression products on the market today. Black Friday deal – 20% off the trainer low socks with Discount Code: TL20, plus free shipping. Site wide sale (no discount code needed from Friday – Monday) will mark down the marathon compression socks & marathon calf sleeves to $30 with free shipping. Cyber Monday deal will be offered via the new discount site: Gear Up (AKA: Active Swaggle) for their marathon compression socks. Sweaty Bands – 20% off order from today until December 10th with Discount Code: STUFFER, free shipping on Black Friday. 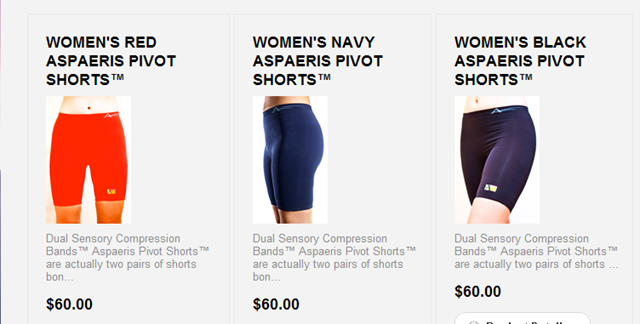 RunningSkirts.com – Discounted skirt prices up to 50% off, 25% off Gift Cards and double reward points! SwimOutlet.com – Free Shipping on $49+ purchase. 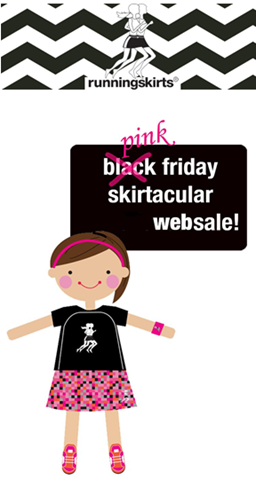 Black Friday Doorbuster Sale items HERE. Some of these amazing deals include goggles starting at $5.95 & 2XU TRI separates between $39 & $45! 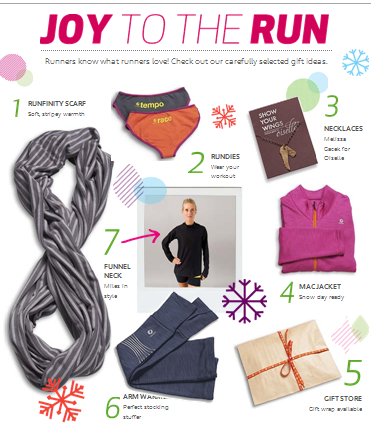 Women’s Running Magazine will be offering a “very” special Black Friday subscription deal. This is my favorite running magazine. You can find details on their Facebook page. 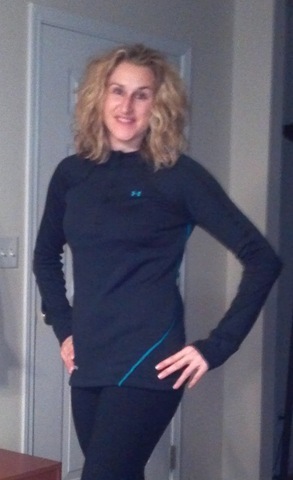 Road Runner Sports – This is fast becoming my favorite online retailers for running items. Santa has already done some shopping for certain members of the family here thru the random email specials they frequently send. For $1.99, you can become a VIP and receive 10% off all purchase, plus free shipping. They are currently running a VIP exclusive sale for 20% off your entire IN STORE purchase. I expect a similar sale to come flying into our inboxes very soon for either Black Friday or Cyber Monday shopping. Watch their Facebook page for details. Running for Kicks in Palos, my favorite IN REAL LIFE running store, will have their Black Friday sale beginning at 10am on Friday. 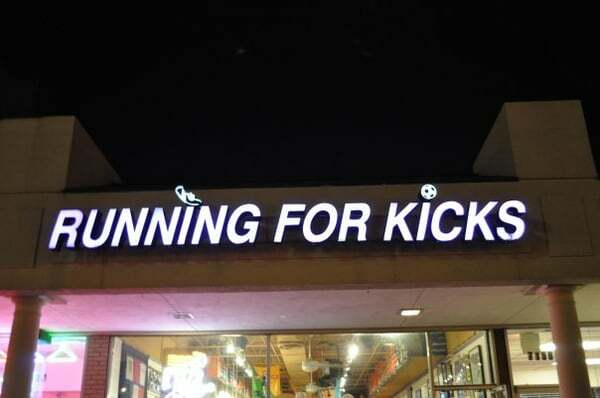 They will have $15 off all shoes and 20% off running apparel. Happy Shopping all! 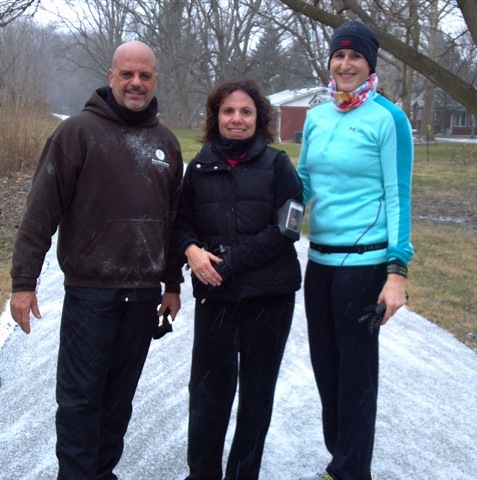 And if you plan to skip the shopping and want to run a few miles, you can find me at Waterfall Glen with a crew at 8am. Northgate Road entrance. Slow Times in the City…. 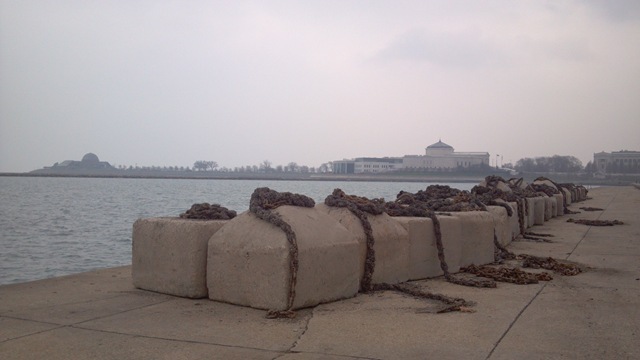 As with everywhere, even the city of Chicago becomes slow and almost desolate at times. Yesterday and today are such days as the workers/commuters are finishing things up before the holiday with many already on vacation. We are suspended somewhere between the normal hustle & bustle of city life and the approach of the holiday. Most take delight in this short, temporary lull which precedes the Black Friday rush. Things are good. Quiet. The streets are empty with few to be seen. The trains carry only a scattering of commuters, all with the same sole desire to go back home to their family for the upcoming holiday. 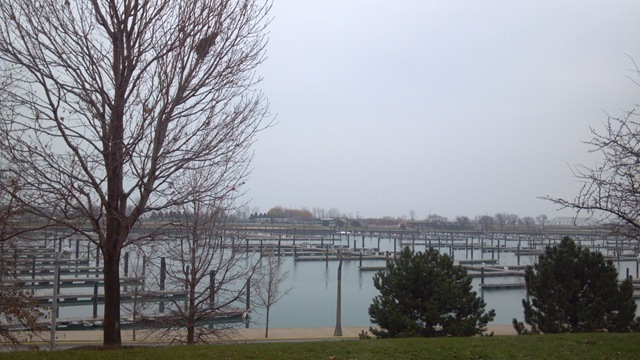 It’s a tranquil time, even in Chicago. 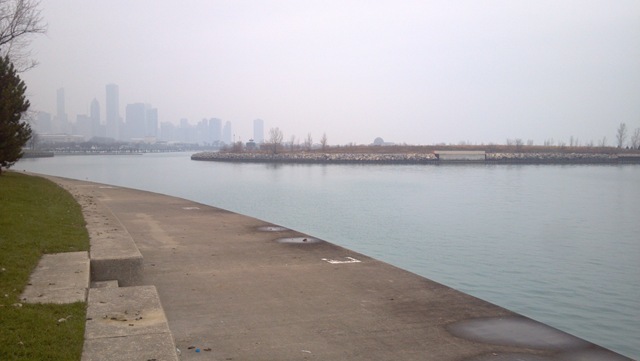 The fog veiling the city just adds to the desolate feel. It’s cool but not cold. Its a great time to be a runner in the city. Easy to take a few steps and be at peace in the surroundings that are normally alive with constant activity. I’m wishing you a very happy holiday with lots of happiness, laughter and maybe a long peaceful run (or two) where you can reconnect with yourself and have a minute to give thanks for all the blessings in your life. 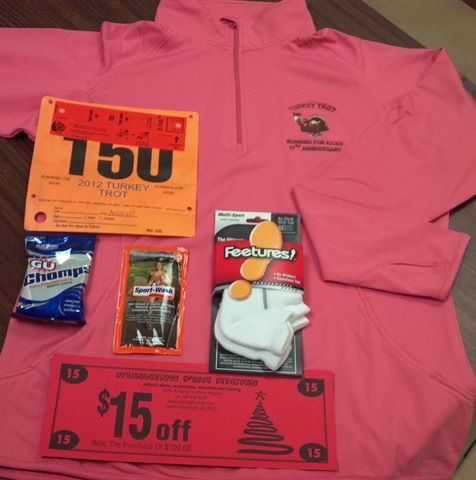 It’s certainly no secret that runners and triathlete’s love free SWAG. However, the majority of the time, the items in the SWAG bag don’t elicit much excitement from me because 1) the items rarely fit (unisex sizing) or 2) the items are not technical or 3) the items are FUGLY. However, on a rare occasion even I get a SWAG bag that is exciting. 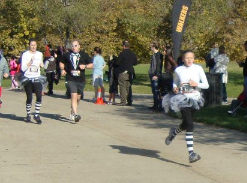 For all intents and purposes, I consider myself a SWAG expert due to the numerous races I run annually. 🙂 Last year, my favorite SWAG item from the Hot Chocolate Race quickly turned to crap as all the print started rubbing off the windbreaker within weeks of receiving the item. Oh yeah, and the sleeves were about 4 inches too short for Ms. TooTall but I know I’m not a “normal” size so no real complaints in that area. This year, I’ve received some cool things but nothing I loved…… until today. 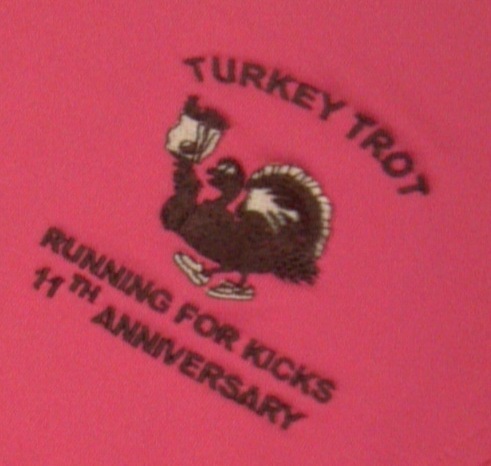 My friend Pam picked up the Running For Kicks Turkey Trot packets last night and delivered them to me today. As you probably already know, I’m a huge supporter of Mel and the Running for Kicks team. 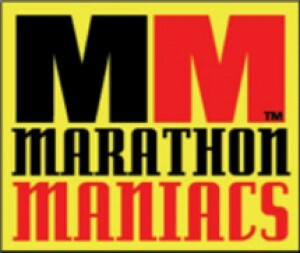 They are a major force in our running community supporting everyone who moves from walkers to runners alike. They also support many local charities and each race they direct brings additional charity monies to our local community. I’d run the Running for Kicks races with or without a good SWAG bag just because I like Mel, the store, the staff and the charity component. However, this year, I would definitely award them with the TTF Best SWAG Award for 2012! 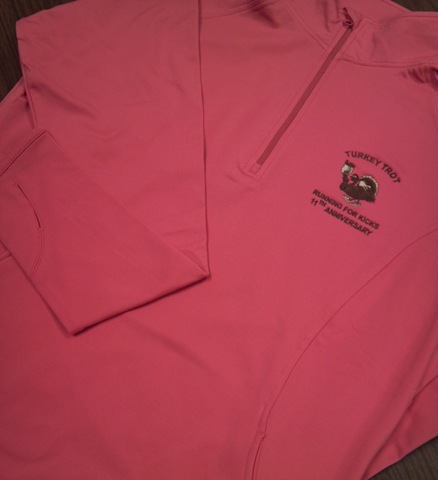 Sport Tek Half Zip lined with fleece (with thumb holes) – SUPER snuggly!!! I register for the races that I want to run, regardless of the price which is evident since I even sprung for an Ironman brand race this year. I will pay more for a race that is in my backyard where I don’t have to travel too far because it reduces the stress on my family. 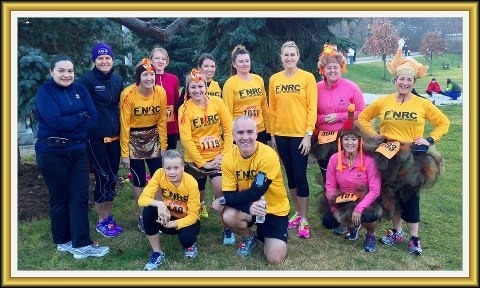 When registration became available for this year’s 4 mile Running For Kicks Turkey Trot I heard nothing but bitching about the price verses the mere 4 mile distance complaints on the cost. 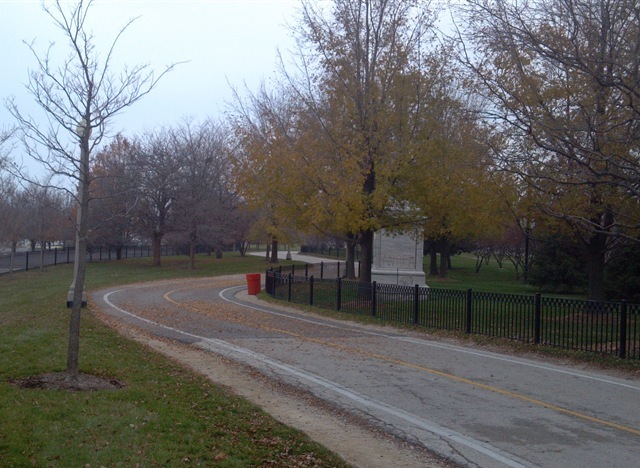 The registration fee was $55 for a chip timed race on Thanksgiving morning. The SWAG, which was previously announced, is the best I’ve received all year and is equivalent to the registration fee in my opinion. Plus the race donates money to local charities and collects food for the Worth Food Pantry. There may not be a band along route but you will have friends and family cheering for you who actually know you by name. You will be eligible to win a multitude of raffle prizes and you will get more than what you pay for in hospitality, plus you will be supporting the local community in a magnitude of ways. I always stay local if possible and I am thankful for great races like this one. This amazing half zip is just a bonus! Do you want to run the cheapest race around to save some cash or are you willing to spend a bit more for a good cause or even a specialty theme? I certainly love the cheap races but also like to go where my friends go and sometimes that means that my friends are the organizers. I like to support the people who support me, my run friends and my community on a daily basis and yes, I don’t mind paying a little extra for that. Tell me which race would win the Best 2012 SWAG award in your opinion. I loved all the suggestions for favorite songs. Since I am currently the owner of a broken iPod and an OLD iPod with outdated music, I’ll need to soon be changing things around and updating my playlist along the way. I will definitely be going thru the list of your favorite songs in an attempt to get a few new jams on my new iPod. Thanks for helping me out. 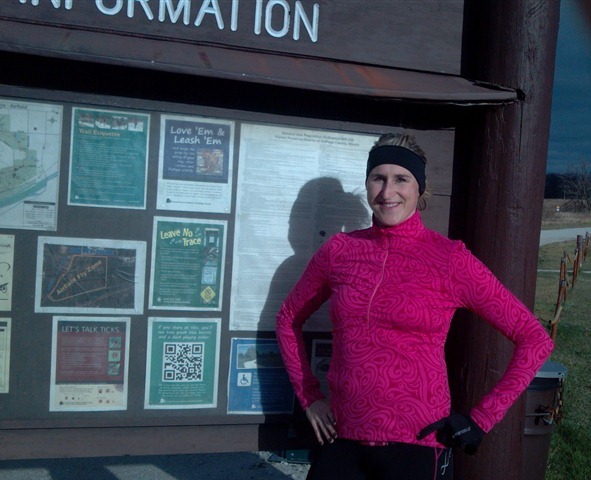 Without further ado, the winner of the orange Yurbuds Inspire for Women is #23 – Jennifer Ralston. Her favorite song is currently Cult of Personality by Living Colour. Jennifer, please contact me at amanda@tootallfritz.com and give me your mailing address so that I can get this in the mail ASAP. 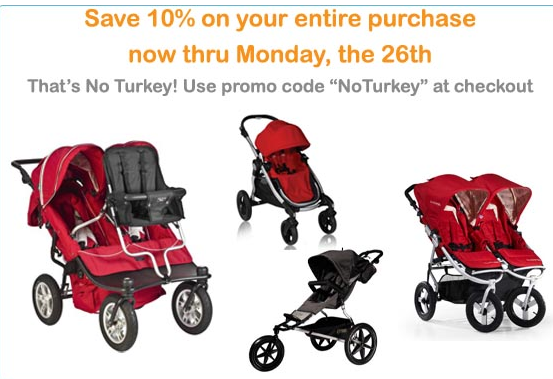 I’m hoping you get them in time to use them at a local Turkey Trot! For the rest of us, the Yurbuds Inspire for Women can be purchased at Target.com by clicking this link HERE or at any Target retail store. I’m planning to pick up a pair in green for myself and the pink ones for Aby. I love the $29.99 price point which makes these a great gift for the active ladies/kids in my life. I hope you all have a great week and happiness and music fills the air for you and your family.